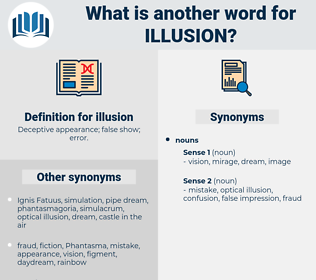 What is another word for illusion? Deceptive appearance; false show; error. 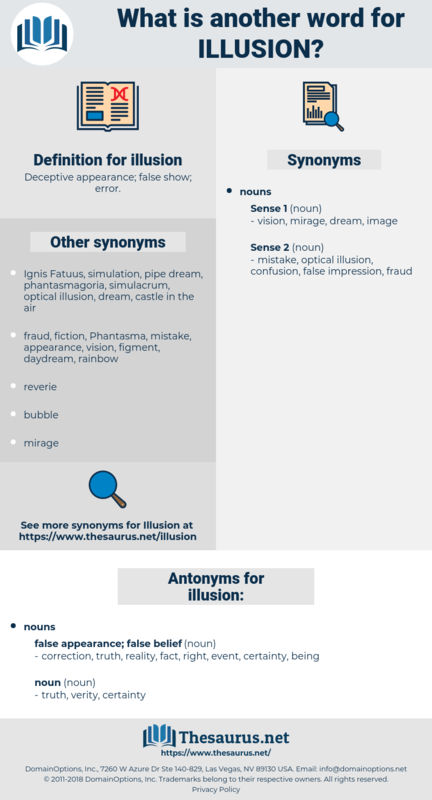 delusion, Self-delusion, illusory, misconception, impression, self-deception, deception, chimera, perception, fallacy, decoy, imagination, dream, vision, excitement, notion, semblance, fiction, mistake, deceit. correction, truth, reality, fact, right, event, certainty, being. But the illusion of home was very faint. Scarce was this illusion gone when one of the men cried out " Land right a head - high land!" phantom, Phantasma, Fantasm, shadow, Phantasm, phantom limb, irradiation, apparition.